Firstly, I want to say that what you're reading right now is a pre-post. If you're reading this at 7AM, I am most certainly asleep. Later I'll wake up and take some antibiotics and then my temperature. Ah, le sinus infection. 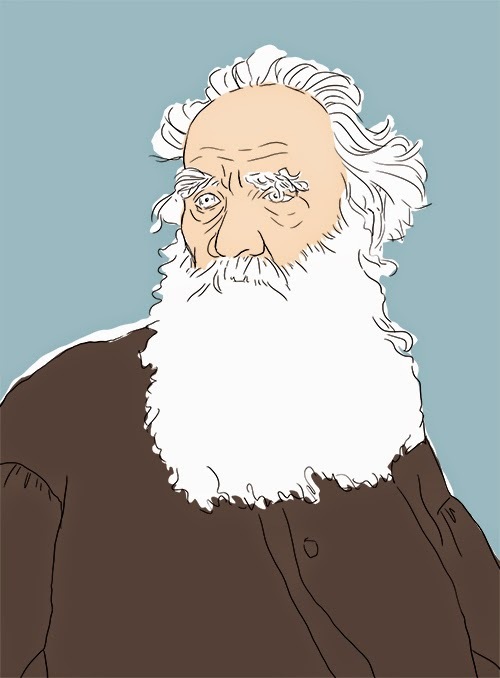 Incidentally, though today's image is indeed a loosely rendered portrait of one Leo Tolstoy, His face is not far from how I am feeling as I write today's post. Now, feel sorry for me and bring me all the udon and brothy soups. Thank you. Not long after I moved to Atlanta, I was sitting with my friend Megan, over some quest no doubt. I was saying how I'd read Infinite Jest, and somehow I liked it more and more the longer it's been since I finished it. On the subject of particularly grueling and muscle-building books, Megan said she felt much the same way about having read War and Peace. So, though I know Megan is actually perhaps several standard deviations above my IQ score, I had to check it out. Unlike Megan, though, I knew I wouldn't be able to read the book with my eyes. Nay, I would spend my days at work sketching away and listening to a very posh english man telling me the stories of Leo Tolstoy. So, a couple of days ago, I finished the book. I have to say...it may grow on me, but I feel like there could have been a bit more economy exercised. Perhaps it's because I'm such a spinster, but I didn't really care too much about the battle descriptions unless they were particularly funny or revealing of some sort of human experience everyone has but never voices. Indeed, there were several of those. While I'm glad to have this book under my belt, I think I would have gleaned a lot more of why it's such an excellent and famous book if I had read it with my eyes on the subway on the way to work. I also would probably have formed a much closer bond with the physical object of the book and how, as I carried it, I looked leagues more intelligent than I actually am. Because be not fooled. That is what reading on the subway is all about. Well, at least 50% of reading the subway is about that. Ok, now I think I need to go and try to sleep through fits of caughing. Dreams of soup await.